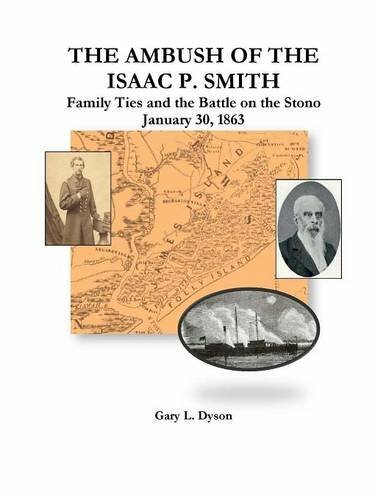 • The Ambush of the Isaac P. Smith: Family Ties and the Battle on the Stono, January 30, 1863 by Gary L. Dyson (Lulu-author, 2016). Built for civilian river traffic in New York, the steamer Isaac Smith was purchased by the U.S. Navy in 1861 and promptly converted into a gunboat for use in the South Atlantic. Between 1861 and 1863, the vessel was engaged in coastal operations, at various times finding its way along the inland waterways of South Carolina, Georgia, and Florida. Its time with the U.S. Navy would end on January 30, 1863, when the Smith was captured on the Stono River by a well-orchestrated enemy surprise attack from shore. The event is one of the better known Confederate tactical successes of the long Charleston siege. Gary Dyson's The Ambush of the Isaac P. Smith "tells the story of the Smith up to the battle and gives the battle story based on eyewitness accounts, battle reports, and official records. The story of the crew's imprisonment as well as the post battle and postwar lives of [Smith officers Frederic Calvin Hills and John Wyer Dicks] are also included as well as some short biographies of battle veterans and civilians, Union and Confederate." I really liked Dyson's first book, A Civil War Correspondent in New Orleans: The Journals and Reports of Albert Gaius Hills of the Boston Journal (McFarland, 2012), and am looking forward to reading this new one. Its account of the Smith operation looks pretty detailed and is supplemented by numerous maps and photographs.